Natural Rubber Adhesive: This consists of a rubber solution and bonding is attained by evaporation of the solvent. This type of adhesive and sealant is not suitable for adverse environments or for structures that need to withstand high loads. It performs well in water. However, it is not resistant to oils and solvents. Natural rubber adhesives and sealants are used to bind glass, wood, paper, plastic, fabric, rubber, iron or steel. Polychloroprene (Neoprene) Adhesive: This type of adhesive or sealant offers strong, quick and permanent bonds and the joints are made by contact adhesion without the use of clamps or jigs. This is used to bind plastics, wood, leather and metal. Acronitrile Butadiene Adhesive: This type of rubber solution is used to bind rubber and plastics. Butyl Rubber Adhesive: The adhesives have low permeability, inherent tackiness and aging resistance. This kind of adhesive and sealant is specifically used to repair the inner tubes of tires and to bind some plastics. Styrene Butadiene Adhesive: This adhesive is usable in the automotive industry because of the pressure sensitive variation. It binds all rubber products. Polyurethane Adhesive: This is a adhesive or a sealant having two component adhesives. This type of adhesive is resistant to acids, alkalis, solvents and oils. A variety of materials including plastics, metals, polyurethane and glass could be joined using polyurethane adhesive. Polysulphide Adhesive: It offers chemical resistance and flexible bonding. Materials like wood, ceramics, concrete, glass, aluminum and steel could be joined using this adhesive which is also used as a sealant. Silicone Rubber Adhesive: It features high service temperature in the range of 300 degree C and low shear strength. This type of adhesive is best suited for sealing applications, glazing and for binding metals, glass and silicone. Gap fill: Maximum space that an adhesive can accommodate between the substrates. Viscosity: Measure of fluidity of the adhesive. Coefficient of thermal expansion: Linear expansion or contraction of the adhesive for unit change in temperature. Thermal conductivity: The ability of the adhesive to transfer heat. Elongation: The fractional rise in the length of the adhesive film under tension. Tensile strength: Maximum stress that an adhesive film is capable of withstanding. The rubber sealant and adhesive films formed after drying can be peeled off without causing damage to the surface of the adherent. They adhere to a wide range of materials and feature a high initial tack. They have comparatively low shear strength and hence used for unstressed joints. Cannot be used for loaded structures or adverse environments. Low resistance to temperatures, chemicals, ultra violet light and oxidation. 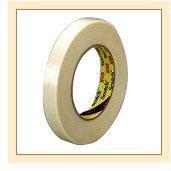 In medical applications such as dressings, tapes, drapes and catheters. They are used for surface protection, color coding, sealing, paint masking, aisle marking and splicing. Used in building, construction, and pipeline applications. Used in abrasives, optics, photonics, and semiconductors.